More evidence is emerging supporting Ferguson officer Darren Wilson’s claims in the shooting of Michael Brown. The most recent story states that Brown did not have his hands up in the air, as supporters have long claimed, when he was shot. The image of people holding her hands in the air has become the unifying symbol of case and the new evidence represents a new contradiction of the account of Brown’s friend, Dorian Johnson, who insisted that Brown was not shot in a struggle in the car and was shot with his hands in the air. However, Brown was unarmed when he was shot and Missouri Governor Jay Nixon quickly called for the prosecution of Wilson and referred to Brown as the victim and Eric Holder ordered a massive federal investigation of the shooting as a civil rights violation before the completion of the local investigation. Much of the anger stemmed from the account of Johnson. As discussed earlier, the evidence indicates that Wilson was suffered some injuries in a struggle and that, consistent with his account, Brown was shot at close quarters, his blood was on the service weapon. The evidence also reportedly supports the claim that the gun was discarded within the car in a struggle. Regardless of how one reads this evidence, it is another cautionary tale in rushing to judgment in such cases before the investigation is completed. The involvement of politicians and protesters in immediately demanding prosecution can have a highly distortive effect on such cases. There has been an immediate and negative response to any suggestions of evidence supporting the officer in this controversy. The fact is that this controversy — and subsequent rioting — was based on the account of Johnson and very early (and contested) stories of what occurred. As I have previously discussed, while the looting and rioting was not their fault, it was highly improper for politicians to assign guilt before the completion of even the initial investigation. Wilson reportedly testified before the Grand Jury that he pulled over in his SUV to talk to Brown and his friend Dorian Johnson about the theft of cigarillos. He said that when tried to get out, Brown slammed the door shut and punched him in the face. He just that, when he reached for his weapon, Brown grabbed it and it was pointing for a time at Wilson in the struggling. He said that it was in this struggle that Brown was shot in the hand. He said that he then chased after Brown who allegedly turned and ran toward him. Wilson testified that he told him to stop and then fired. He said that when Wilson continued, he fired more shots. The independent experts hired by the Post-Dispatch said that they believed that the evidence supported Wilson on some critical points and that a significant struggle occurred in direct and irreconcilable conflict with the account of Johnson. Forensic pathologist from San Francisco, Dr. Judy Melinek, said that Brown’s palms could not have been facing Wilson in the standard surrender position – with hands up and palms out – when he was shot. 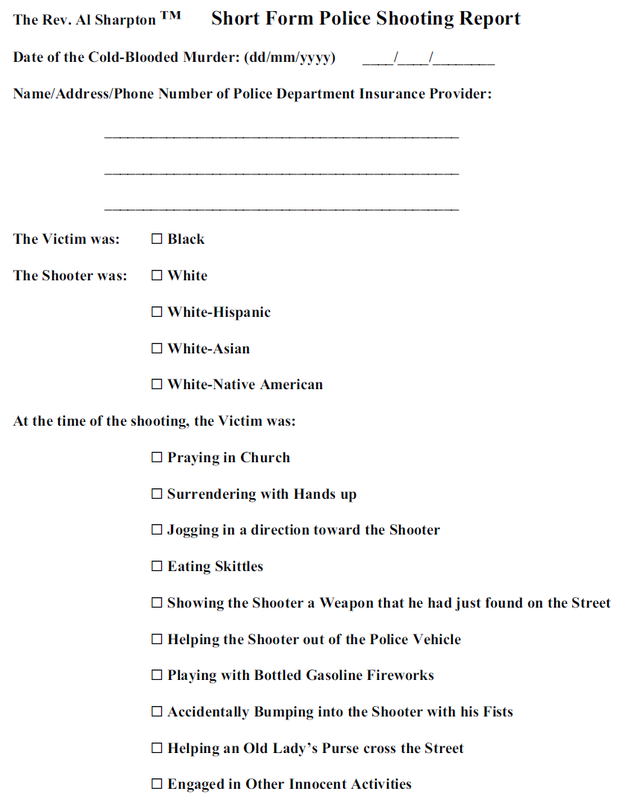 While other scenarios could explain the evidence and there is still the question of why so many shots were fired (even if the officer’s account is true), there may remain considerable conflicts in the original account. Those conclusions would seem to support growing view that the Obama Administration also found insufficient evidence to support any federal charge in the shooting and is leaking stories to prepare people for the closing of the investigation. Y’all finally found an autopsy you like? Talk about shopping for justice. zecalis – shopping for justice is three autopsies. “Sharpton’s alarmist rhetoric that fear of young black men is leading to frequent shootings is unfounded and unsupported. He would better serve the nation if he went into urban communities and started a conversation about ending the gang-banger lifestyle and focusing on education instead. I love her avatar. It looks like she is starting a blog. Maybe we will see more stuff like this from her. I hope so. Squeeky, you’re too funny. Is Penelope your alter ego? She seems very much like you! In fact she reminds me of you, lol. ROTFLMAO!!! We think a lot alike! Now we get to see the hucksters of the grievance syndicate strut their stuff as they deconstruct common sense itself just to avoid admitting they rushed to judgment. Professor, I’m sorry your commitment to truth and rule of law has sullied your reputation amongst statists. I guess if this is a white-wing place now, it’s a nice day for.. Sorry, Turley. Your blog has turned into a white-wing piece of racist trash. Your commenters are the worst of the worst in the “bitter old white man brigade”. We need to have a lie detector test given to sidekick in the cigar robbery. He needs to be prosecuted for felony murder. When a person dies in the commission of a felony, including the flee from the scene, then the co felons are responsible for the death. Here is was co felon but that does not matter. His defense will be that they did not steal the cigars. Jill – listened to the interview which I had some trouble with because you have an “expert” who did not do the autopsy commenting on the autopsy, but I did find his comments on the government on point. They should have been their for the private autopsy and they could have had each had their findings. Thanks for the link. Brilliant … so what was he shot with? He was shot with a gun of the government. Shot by a government agent. “The results of a private autopsy of Michael Brown, the unarmed black teenager fatally shot by a police officer in Ferguson, Missouri, showed that he was shot at least six times. The information raised even more questions about the events surrounding Brown’s death, and kicked off a fresh round of protests in the St. Louis suburb. The results of a state-performed autopsy have not been released yet, and U.S. Attorney General Eric Holder has ordered a federal medical examiner to perform a third autopsy. Forensic pathologist Dr. Cyril Wecht joins Here & Now’s Meghna Chakrabarti to discuss what an autopsy can reveal about a crime scene — and what it can’t. This is the info to the link in my prior post.